Here’s the last of my project with the “I Am Me ” suite! To see the other ones, click here (projects chosen by the Scrapbook and Card Today magazine blog) or scroll down! 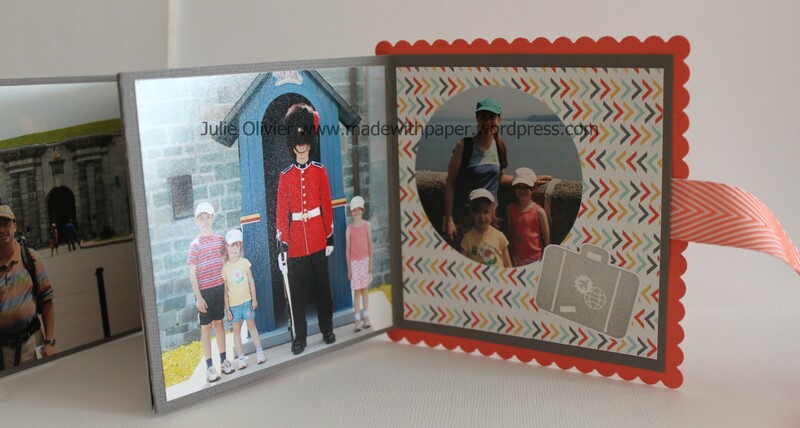 A mini Scrapbook can be a great gift for the grand-parents! It’s also a compact way to bring some pictures of your recent trip to show to your friends and family. 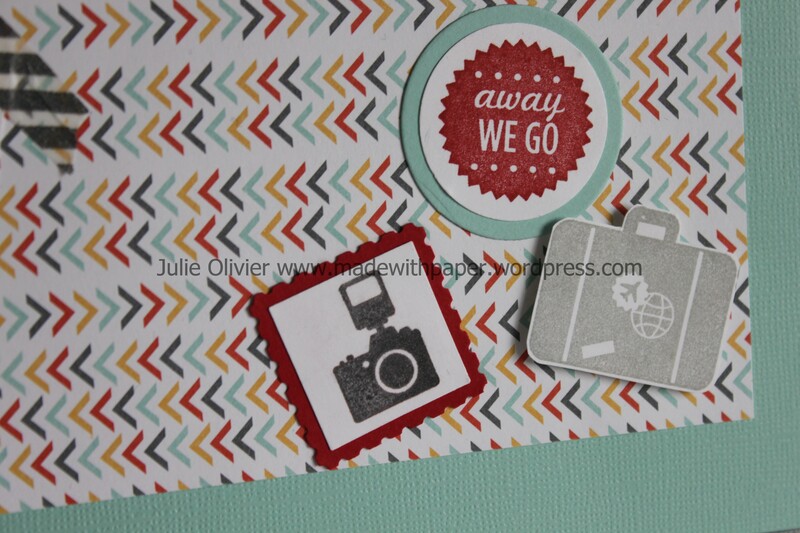 I used the “I Am Me” suite to create this cute mini Scrapbook. 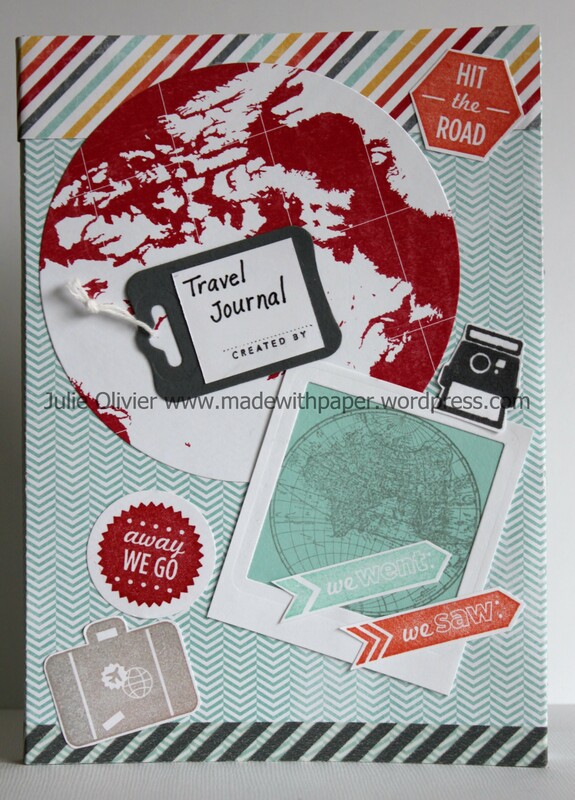 To make this mini-accordion Scrapbook, I cut a 12″ x 12″ Basic Gray card stock sheet in 3 strips of 4″ each. I scored at 4″ and 8″ on all of the 3 strips. 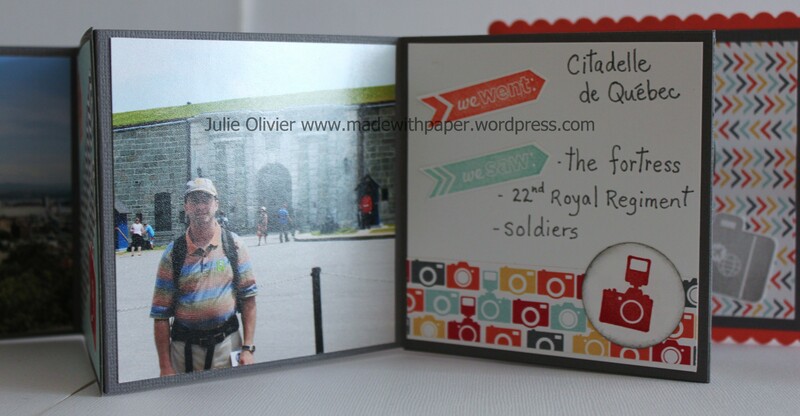 Then, I glued them together to make one big line, superposing the 4″ x4″ square. I fold them in an accordion manner. 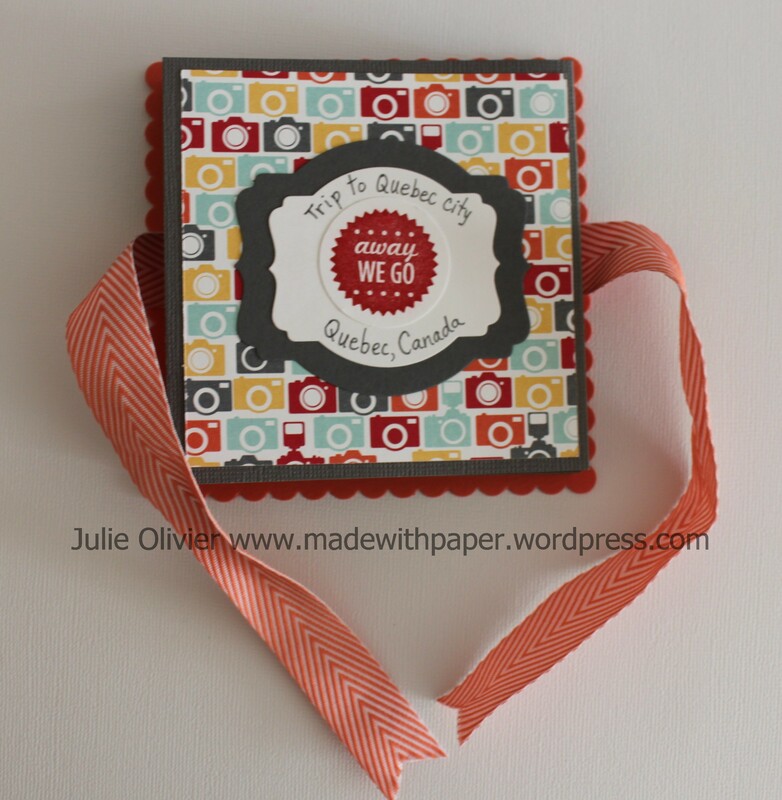 I cut a scalloped square from the Square Framelits collection in Calypso Coral card stock. 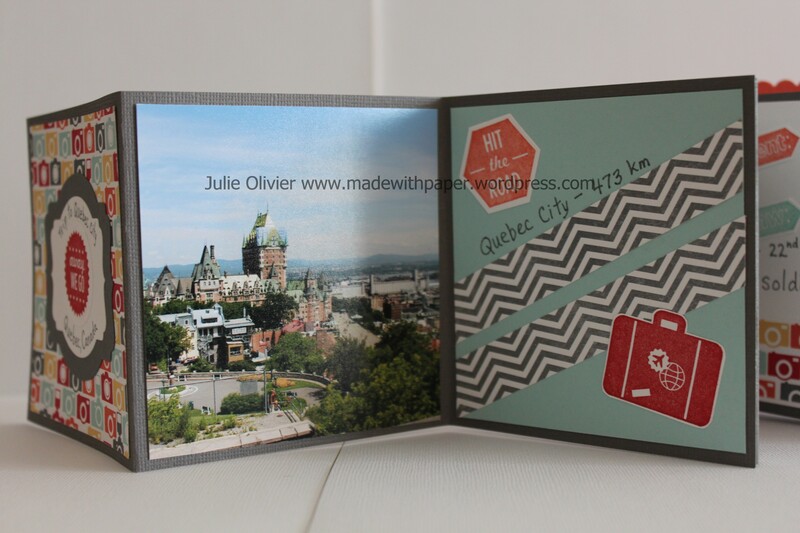 The ribbon is glued on that scalloped square, with the accordion scrapbook on top. Accessory: 3/4” Calypso Coral Chevron Ribbon. I also made a Scrapbook page with the “I Am Me” suite. I started with a Pool Party Core’dinations Card stock as the base. I used the I Am Me Designer series paper, the Around the World Stamp set and the Epic Day This and That Washi Tape as embellishments for this page. 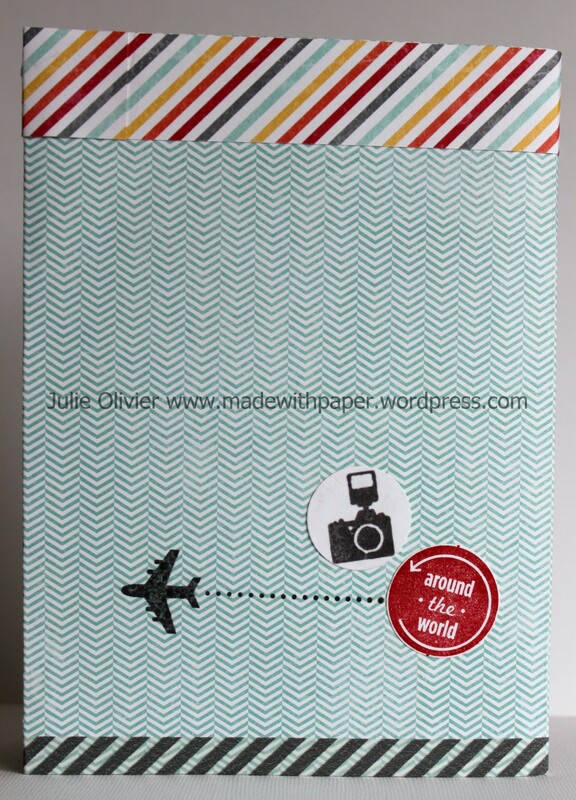 These are perfect for a Travel or Vacation Scrapbook page! Stamp set:Around the World, Rev up the fun! Tools: Big Shot, Ovals Collection Framelits dies, Squares Collection Framelits dies and Circles Collection Framelits dies; 1-1/4” Circle punch, 1” Square punch, Postage Stamp punch; Dimensionals. This is one other project that I made with the “I Am Me” Suite (special request from Stampin’up and the Scrapbook and Cards Today magazine). 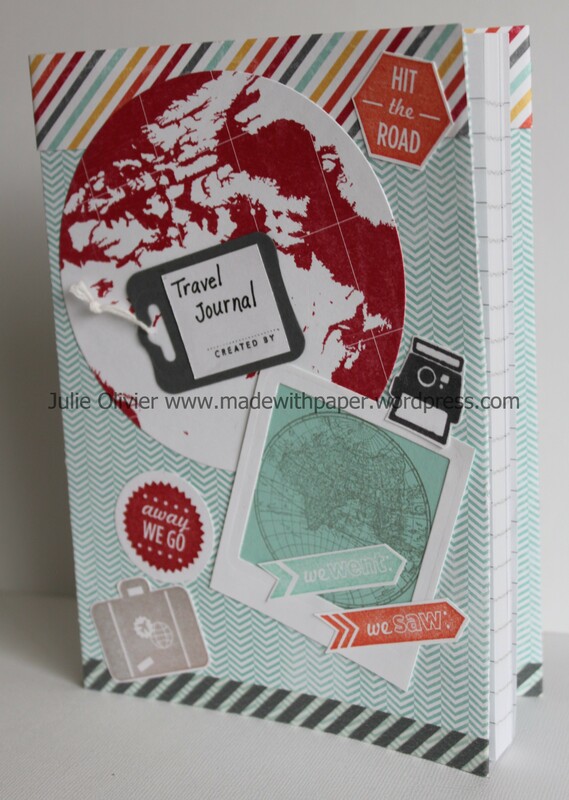 I used the stamp set “Around the World” and the Designer Series paper “I Am Me” to create this Travel Journal. I took a blank notebook that I had and I made a new cover! 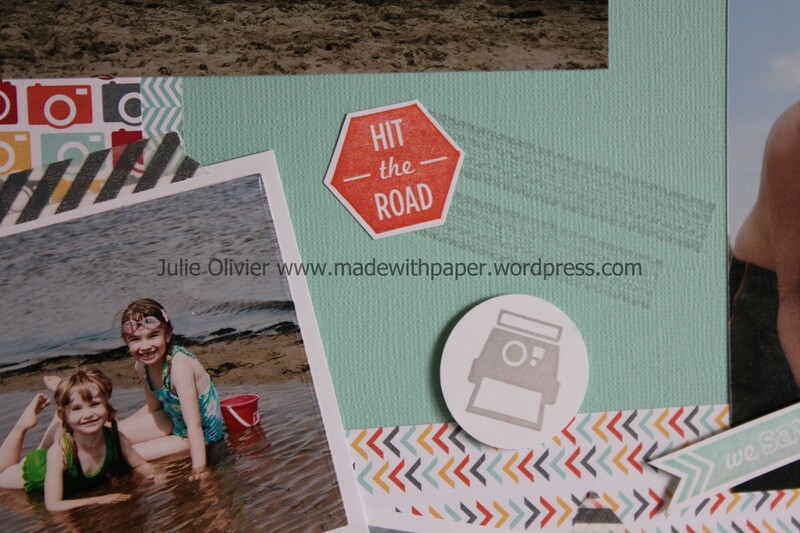 The Background is the I Am Me Designer series paper and a strip of the Epic Day This and That Washi tape. I made my own “polaroid picture” with the Square Collection Framelits and a stamp of the Earth from “Open Sea” stamp set. I also used the Chalk Talk Framelits Collection to make the little tag and I used the Rotary This and That Rotary Stamp to stamp the “Created by”. The rest of the images are from the stamp set “Around the World”. Tools: Big Shot, Chalk Talk Framelits Collection, Squares Collection Framelits dies and Circles Collection Framelits dies; 1-1/4” Circle punch, 1″ Circle punch. Around the World Away we go! Good news! I was featured as a guest artist on the “Scrapbook and Cards Today” magazine Blog last Saturday! If you want to see some of the projects I made, click here. I was asked to make 8 projects with the “I Am Me” suite (check it on p.47-48 of the current catalogue). They pick 4 projects from the eight I made. But don’t worry, I will show you the 4 others!!! Here’s one of them: a card that I made with the “Around the World” stamp set. It’s a perfect card to say “good-bye” to someone who’s going for a trip and moving to a different country. Word Bubbles Framelits and Just Sayin’ stamp set. Order them together and save 15% on each. Click here to order the bundle today! 1. Cut half a sheet (5-1/2 x 8-1/2″) of Pool Party card stock in half and fold to make the card base. 2. Use the “cloud framelit” (from Word Bubbles Framelits Dies) to create a mask to sponge some clouds with Craft White ink, in the upper half of your card. 3. Stamp the plane image (from Around the World) with Basic Gray ink. Stamp the 3 other images from the same set on Whisper White paper with Real Red, Calypso Coral and Basic Gray. Cut the circle with the 1-1/4″ Circle. Use the scissors to cut around the 2 other images. 4. Cut 2 strips of the “I Am Me” Designer Series paper. Adhere on the card. Adhere the 3 stamped images. 5. Stamp “Miss you already” from “Just Sayin’ ” and cut with the matching Framelits. Adhere on the card with dimensionals.